Smiling happy painter with a paintbrush in hands posing on camera in art studio. Women Beautiful Painter Posing and Smiling Into Camera With Brushes and Palette in Art Studio Hung With Sketches and Drawings. Young smiling painter posing on camera in her art studio full of masterpieces. Young smiling painter holding paintbrushes in her hands and posing on camera. Young smiling painter showing paintbrushes on her art studio. Young happy painter posing on camera with all paintbrushes that she found in her art studio. Young happy artist with paintbrush in hands , posing on camera while working on oil painting in art studio. Portrait of beautiful young painter posing on camera in her art studio. Beautiful painter holding paintbrush in hands and posing on camera while working on oil painting. Young painter holding paintbrush in hand, posing with her masterpieces in art studio. 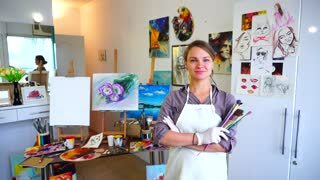 Young smiling painter with paintbrush in hand posing on camera in art studio. Close up friend's hands taking pictures of smiling asian woman painter with her flowers painting in home art studio on mobile phone screen. Blurry happy artist posing with her painting.